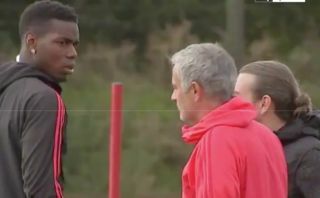 Manchester United midfielder Andreas Pereira has spoken out about the video clip of an apparent disagreement between Paul Pogba and manager Jose Mourinho in training. The pair were seen exchanging words in what looked a bit of a tense encounter on the United training pitch – and right in front of the watching Sky Sports cameras as well. It was later reported that this clash was over the timing of an Instagram post by Pogba in the Carabao Cup defeat to Derby Country. Pereira has now confirmed that that was the case and that there had been a misunderstanding about the timing of the France international posting the clip of him joking around as he watched from the stands. Pereira insists in an interview with UOL, that his team-mate posted it before United ended up losing the game on penalties, not after. ‘We were winning the game 1-0 at the time of the video,’ he told UOL, as translated by the Manchester Evening News. ‘Then we lost the game, and people said that Pogba posted later. But he posted before.